Search For "Environmental Markets" Companies in Elko, Nevada - Click Here Now! We Are Breeders Of True To Size Mini And Micro Mini Dachshund Puppies, Raised In Our Home, Played With Daily. Our Adult Breeding Dogs Our Tested Before Breeding So That Health Issues Are Not Pasted Down In Our Bloodlines, This All Makes For A Happier Puppy For A Lifetime Companion For Your Buyers. 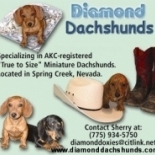 Diamond Dachshunds in Elko is a company that specializes in Forestry Services. Our records show it was established in Nevada.